Brilliance Audio, 2014. 11 hours on 9 discs. This audiobook was too good. Every time I stopped my car, I didn’t want to turn off the CD player and get out. Finally, when it was down to the last half-hour, I brought the final CD into my house to finish listening – even though I was already coming home late after playing games after work. The entire book was tough to shut off at any time, but a half-hour from the end, it was impossible. This book is set in the near future, on NASA’s third mission to Mars. 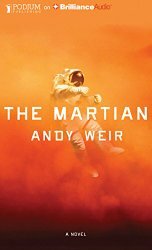 A freak accident has happened, and Mark Watney was left behind, since all his crewmates thought he was dead. The book is about his struggle to survive. Using what he has (their mission was cut short), he works to figure out how to survive long enough to last four years until the next scheduled mission to Mars. And that's not easy. He doesn't have enough food. He doesn't have enough water. He has no way to contact earth. He is miles away from the planned landing of the next Mars mission. Mark is a botanist and an engineer – and his ingenuity and resourcefulness are incredible. Everything he does to survive – to make plants grow in Mars, to make water out of rocket fuel, for example – at least sounds like plausible science. And enough things go wrong to be completely believable. Just when you think he’s finally got it made, something new almost kills him, and new plans must be made. The description of the mission to Mars and the equipment sent is told in such a way, I caught myself thinking it’s already been done. The tension is gripping, and the science is fascinating, and you grow to really like this guy who doesn’t give up even when abandoned on Mars. If NASA ever does send humans to Mars, I think they should read this book first. Just in case.